Situated in a sunken courtyard in front of the Paramount Plaza building, a UFO-like craft serves as the entrance to Mars 2112, taking patrons to the dining tier. 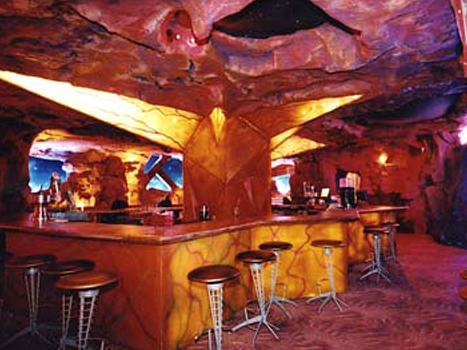 Known as the Crystal Crater, the dining area is three stories high, and decorated to match a playfully possible Mars underground landscape. The "Mars Bar" is very popular with the mid-twenties and older crowd, as one can enjoy the kitschy atmosphere of a B-movie set, while enjoying "Marstinis" and "Cosmos-politans". Servers dress in futuristic costumes, with fake space-themed names. The food and drink items are all named after astronauts (both real and fictional), or places in space. Faux, mute aliens made of rubber, wearing latex and spandex suits are situated throughout the building. To return to the main level, where the "Space Arcade" and gift shop are, patrons pass through two doors to the "teleporters" which take them up above.